When I was at school, I didn’t like history much, except for the gory “details”, though I guess I would have been less inclined to call them details had I been the burnt alive which or the disembowelled traitor. Then I grew up and started to see the “details” all over the news and this made me realise the main thing in history is that it tells the story of what human beings are capable of, whatever the period in which they saw the light of day. 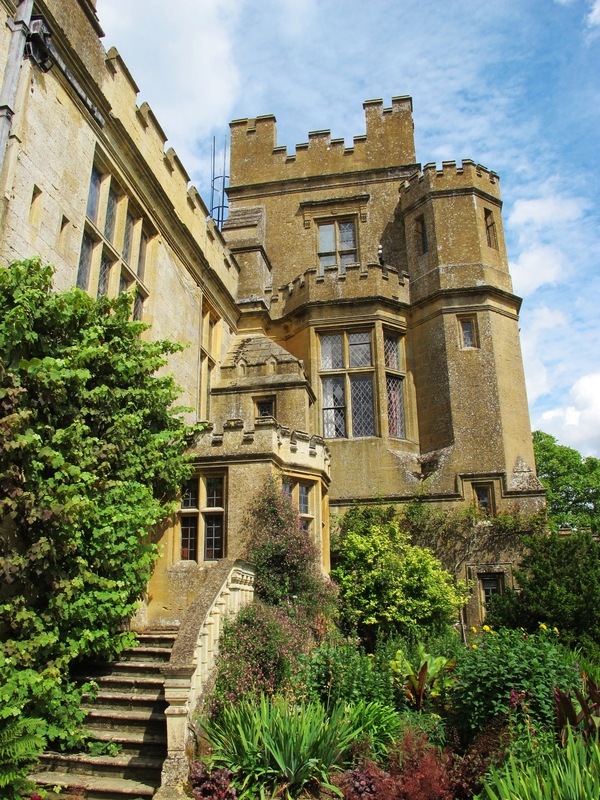 Sudeley Castle, halfway between Cheltenham and Broadway is one of these places where the wanderer can ponder about how life was for the prominent figures who inhabited it. Katherine Parr, the last wife of Henry VIII, Ann Boleyn, Henry VIII, Richard III and Queen Elizabeth I all resided at Sudeley Castle and walking the same corridors and rooms as them beats a selfie with any living celebrity. If the walls could talk, I’m sure they would show how these people were battling the same life fights as the rest of us. It looks as if they muffled more than a baby orientated row between Henry and Ann. Maybe lullabies bounced off the same walls when Elizabeth I was little. Did Richard III witnessed the winter of his discontent from Sudeley Castle’s windows? Of course not, it was in York. No season could lead to such gloominess in the Cotswolds! I enjoyed Sudeley Castle immensely. This Tudor castle is warm and inviting, blooms in the garden give it a colourful smile and the ruins of the great hall encase it in a romantic atmosphere. It even boasts its own ghost, a woman wearing Tudor clothes thought to be Katherine Parr. With or without ghosts, it is a must visit attraction in the region. Having had a glimpse into “la petite histoire” of kings and Queens at Sudeley made me want to read about the big history, or maybe I’ll take the lazy way out and settle for watching The Tudors. It certainly is a beautiful castle. Your photos do it justice, they are lovely. Jolies photos, commentaires intéressants qui donnent comme d’habitude envie de visiter les Costwolds! Il ne vous reste plus qu’à venir! I love this place! Also thanks for stopping by!